150 p., 15,5 x 23 cm. Edited by Andris Breitling and Theo Kobusch. With contributions by Thomas Bedorf, Andris Breitling, Jean Greisch, Theo Kobusch, Burkhard Liebsch, Paul Ricœur and László Tengelyi. Paul Ricoeur would have been 100 years old on February 27, 2013. 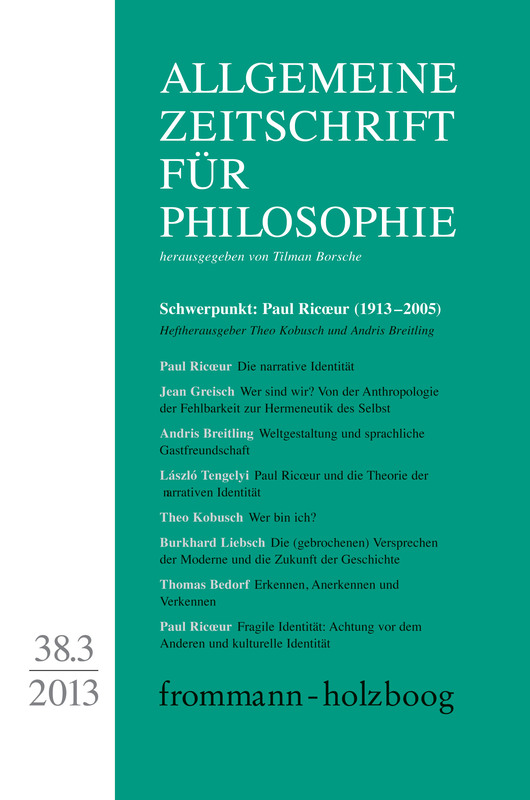 This was a perfect occasion for dedicating a special issue of the Allgemeinen Zeitschrift für Philosophie to his philosophical works. Ricœur is well-known as the founder of hermeneutic phenomenology. His works however do provide productive starting points for other philosophical positions and scholarly disciplines as well. The objective of this issue is to show these starting points and to invite the reader to do a critical study of Ricœur. The individual articles deal with fields of research ranging from philosophical anthropology to linguistic philosophy, the philosophy of history and the philosophy of the social sciences to ethics. Special emphasis is placed on Ricœur‘s philosophy of the self and on the concept of narrative identity. This is also the focus in the two texts written by Ricœur himself which are published here in German for the first time. Ein systematischer Vergleich von Heideggers Kantbuch (1929) mit Ricoeurs Buch 'L’homme faillible’ (1960), das seinerseits als »Kantbuch« gelesen werden kann, deckt nicht nur tiefgreifende Unterschiede in der jeweiligen Kantinterpretation auf. Er zeigt zugleich die Verwandtschaft zwischen Cassirers und Ricoeurs anthropologischem Ansatz auf. Darüber hinaus lenkt der Vergleich die Aufmerksamkeit auf die sich bereits bei Heidegger andeutende Verwandlung der Was-Frage in die Wer-Frage, die ein Gegenstück in Ricoeurs »Hermeneutik des Selbst« hat, die sich im Spätwerk zu einer Phänomenologie der menschlichen Grundfähigkeiten ausweitet. Focusing on Ricoeur’s hermeneutic phenomenology of language, the aim of this paper is, on the one hand, to show how the world of human experience is configured and reconfigured through processes of semantic innovation. On the other hand, the question is discussed how it is possible for members of different linguistic and cultural communities to communicate – if it is true that these processes culminate in the establishment of different »world-views« (in the sense of Wilhelm von Humboldt). The first part of the paper retraces the way in which Ricoeur developed the methodical approach of a hermeneutic phenomenology of language based on the model of the text (I). Then, Ricoeur’s theory of metaphor (II) as well as his theory of narrative (III) are presented. Finally, taking up Ricoeur’s theory of translation, i.e. his concept of »linguistic hospitality«, the perspective of an ethics of intercultural communication is outlined (IV). Anticipated by several thinkers of the Western philosophical tradition over a long period of time, the theory of narrative identity was ultimately put forward in the 1980s by philosophers like Alasdair MacIntyre, Paul Ricoeur, Charles Taylor, David Carr and others. In the present paper, an attempt is made to give a survey of the process in which this theory was integrated into contemporary philosophy during the last two and a half decades. It is pointed out that, even in analytic philosophy, the narrative conception of the self came to a certain break-through (especially with the work of Marya Schechtman), but it is equally shown how it increasingly became the target of fundamental objections and how it led to most instructive controverses. The main thesis that underlies the entire survey is that the present state of discussion concerning the narrative view of the self bestows a new actuality upon the Ricoeurian version of the theory. Theo Kobusch: Wer bin ich? Ricoeur’s critique of the analytical philosophy of the person is directed against the tendency of reification inherent in this kind of philosophy. To bring out the »ipseidentity« against the »idem-identity« also means to accentuate the type of identity which is characteristic of a person as such, in contrast to the identity of a thing. Due to this self-identity of persons, a particular kind of beings which are different from the self, namely others, gain special importance for the self – in contrast to that which is different from a thing, for which nothing can be important. This important other is but another self, another person. It is in the light of this special relationship of one person to another that the full meaning of the new concept of responsibility emerges, which has replaced the notion of imputability. It is well known that time and again the end of history has been announced. Nevertheless, Ricoeur felt obliged to remain true to the practical implications of promises which were connected with modernity. This essay shows that for Ricoeur the binding character of these promises is yet at stake and that he refuses to believe that especially the history of Europe is to be regarded as a cemetery of broken promises which, consequently, could not be taken seriously any more in a ›global‹ perspective. With special respect to Levinas’ critique of historical thinking this essay discusses the ensuing consequences for the theoretical profile of Ricoeur’s practical philosophy of history. In his book, ›The course of recognition‹, Ricoeur brings together different elements of his reflections on the practical self. He presents cognition, relation to self, memory, and intersubjective, reciprocal self-confirmation as facets of a comprehensive, albeit not integral idea of recognition. Ricoeur’s approach is innovative especially by integrating the theorem of the gift into the structure of intersubjective relations of recognition. Thus the harmonizing symmetry effects of common recognition theories can be avoided. However, in contrast to what Ricoeur intends, the suggestive potential of the theorem of the gift – as the paper argues – is only to be realized if one merges a theory of the gift with a theory of alterity.